Who was the captain of the Titanic? Facts about Captain Edward J Smith. His life and story. Great information for teachers, students and historians. If there is one single person who could have averted history it was surely the captain of the Titanic, Edward John Smith. Who was Edward John Smith? Born on January 27, 1850, in Hanley, Staffordshire, England, Captain Edward J. Smith joined the White Star Line in 1880 as the Fourth Officer of the SS Celtic. He served aboard liners to Australia and to New York, where he quickly rose in stature. 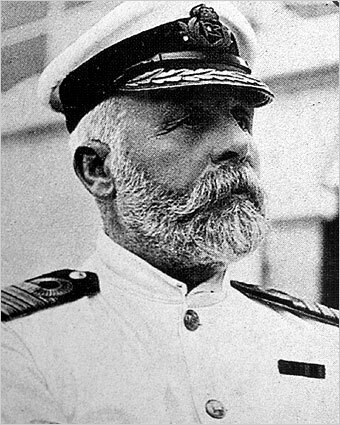 Despite some minor incidents onboard Olympic, Smith was again appointed in command of the greatest steamship when RMS Titanic left Southampton for her maiden voyage. Although some sources state that he had decided to retire after completing Titanic's maiden voyage, an article in the Halifax Morning Chronicle on 9 April 1912 stated that Smith would remain in charge of the Titanic "until the Company (White Star Line) completed a larger and finer steamer." What was his role in the sinking of Titanic? Captain, Edward J. Smith, had been napping in the chart room after leaving the orders: "If it becomes at all doubtful let me know at once." He awoke from the vibration of the impact and headed to the bridge. Looking at his first officer he asked "What have we struck?" "An iceberg, sir ", was the reply. Captain Smith summoned the ship's carpenter Thomas Andrews, one of Titanic's designers from Harland & Wolff Shipbuilders. Andrews was traveling on Titanic's maiden voyage to work out any "bugs" that might occur with the new liner. Both men were asked to conduct a visual inspection to access the ship's damage and report back. Minutes later, Captain Smith was all too aware of the fate of his ship, and equally aware of the fact that his ship's lifeboat accommodations were far fewer than the number of passengers and crew on board. Smith would now for the first time in nearly 40 years at sea, give the orders to abandon ship. He expressed to his officers the necessity of calmness and order in the evacuation. His orders were to see that the crew informed everyone on board and to report to the boat deck with their lifebelts on. The order was given to swing out the boats. How did Captain Smith Spend his last moments? king. According to some historians and Bob Ballard’s book, The Discovery of the Titanic, Captain Smith was on the bridge at 2.13am, seven minutes before the Titanic disappeared beneath the waves, and went down with the ship. Sources state Smith wandered off to the ship’s wheelhouse, while others say he was actively present in the radio room. Working near collapsible B, Junior Marconi Officer Harold Bride reported seeing Smith dive into the sea from the open bridge minutes before the final plunge began. One story states he carried a child to the overturned collapsible B after the sinking and swam off to freeze in the water, but according to the documentary Titanic: Death of a Dream, that story is generally considered romantic fiction. Likened to another belief that his last statement to the crew, “Be British” That stirring sentiment also adorns a plaque to the Captain in Hanley, Stoke-on-Trent. Like so many others Smith's body was never recovered.